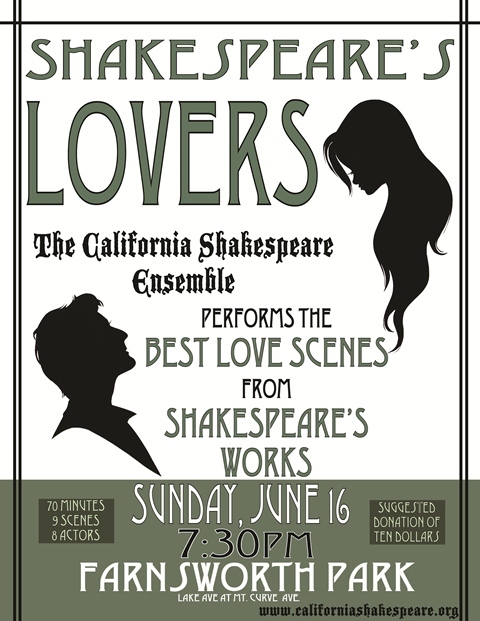 The California Shakespeare Ensemble is digging out the greatest scenes from all of Shakespeare’s work and performing them live as part of Shakespeare’s Lovers, Sunday June 16th at 7:30 pm. The performance will take place at Altadena’s Farnsworth Park, on the corner of Lake Avenue and Mt. Curve Ave. (568 Mt. Curve Ave, Altadena, CA 91001). The fast­-paced, fun show is an encore of their popular opening day performance at Descanso Gardens’ Earth Day 2103 celebration this past April made up of ensemble members’ favorite Shakespearean love scenes. You’ll see everything from the popular to the obscure, the comic to the tragic, the epic to the trivial. Some of Shakespeare’s best writing on love rarely sees the light of day. It is buried in lesser­-known plays that don’t have as much box office draw. We all know Romeo and Juliet, but when was the last time you saw Henry VI Part 2? Two Gentlemen of Verona? Shakespeare’s Lovers presents the best of all worlds. Suggested $10 donation at the door. For more about the company visit www.californiashakespeare.org. The California Shakespeare Ensemble is a theatrical side project for working actors in Los Angeles. Every show’s cast varies, but past guest performers have included Ken Baumann (series lead on ABC Family’s Secret Life of the American Teenager) and David Blue (series lead on Syfy’s Stargate: Universe), Fred Cross (series lead on The Joe Schmo Show) and others.